Reykjavík and the Open Tower. Most of the towns we have been driving between for the last four weeks have a population under 1000. Reykjavík on the other hand has a population around 200,000 (two thirds of all Icelanders live there). 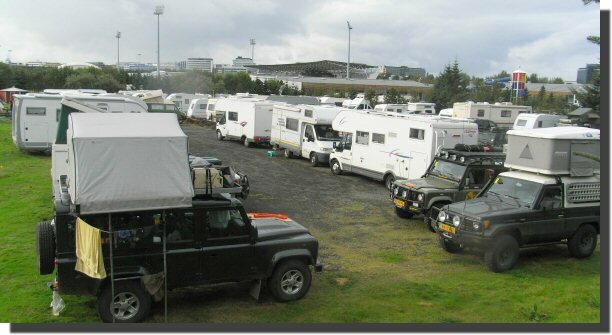 Finding a campsite in most small Icelandic towns can be done by pulling into the fuel station and looking round. The campsite is primarily aimed at tent campers, but there is an area set aside for vehicles (with some electrical hook-up points). Rather strangely there are no chemical toilet dump facilities at the campsite. As there are no marked pitches the capacity of the site is determined by the desperation of the last arrival. At weekends it may pay to get there early in the day. We were there for Reykjavík's annual Culture Night and it was full. 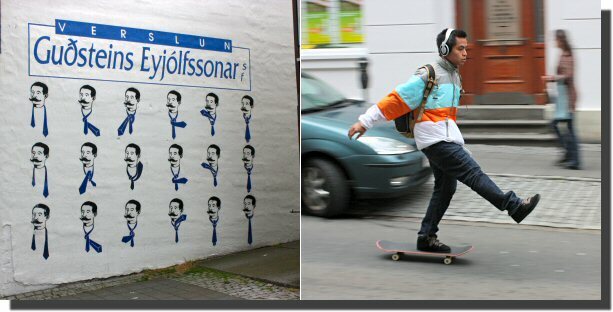 In general I dislike cities but Reykjavík is an exception, being small, walkable and quirky. In 2009 it is also just about affordable. Reykjavík has a fine selection of galleries, museums and other civic buildings, many of then free or costing only a few Euros. Bus routes in Reykjavík are extensive but buses are infrequent. Its a great place to wander and people-watch. Below are some of the more quirky sights. One of the tourist attractions of Reykjavík is the Perlan (formerly four very large hot water tanks, now one tank contains the Saga Museum). Round the back of the Perlan is an artificial geyser. If you are there a bit before 12:00 you can talk to the man who's job is to switch it on and then sit in his car and watch it all afternoon. 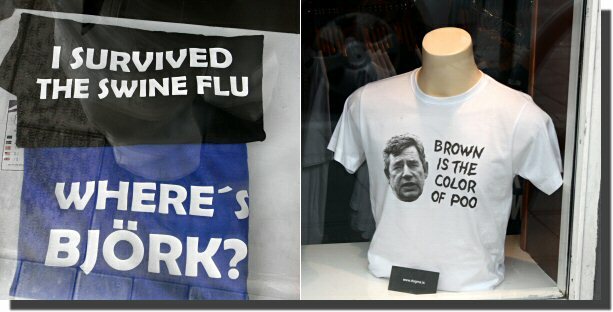 There are many tasteful t-shirts for sale (the UK is blamed for making the Icelandic financial crisis worse). One of the highlights of Reykjavík is the immense concrete Hallgrimskírkja church. Built between 1940 and 1974 and still controversial. Its 75 metre high tower affords great views over the city. Or so the guide books say. 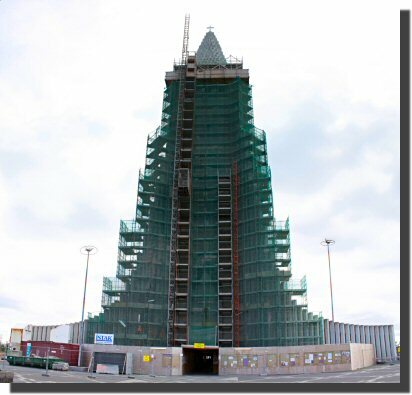 Unfortunately, as you can see, it is currently undergoing repairs and is covered in scaffolding. But no! 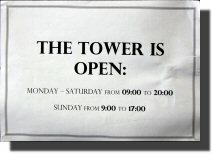 A notice at the bottom proclaims that the tower is open. So we bought our tickets and ascended to the viewing gallery. 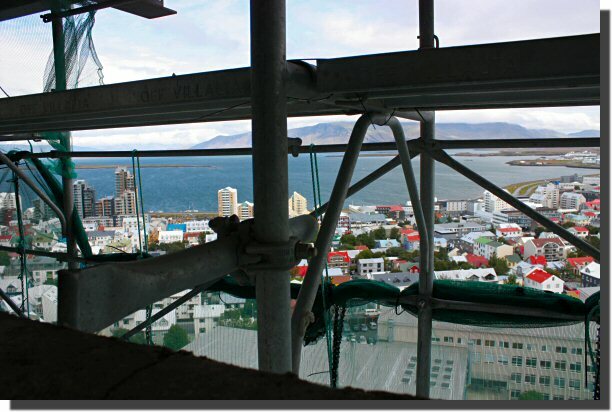 Now I don't think the scaffolding in anyway detracts from the view! But some less charitable folk might think that the church authorities were being a little optimistic in describing the tower as open. Home - This page last changed on 2009-08-22.